First off, sorry for the lack of posting, but seeing as my entire future rests on completing these last few days of exams here, despite my desire otherwise, it seems as though common sense dictates that law school should currently take priority over blogging. And, although common sense is almost always annoying, I must take heed…..But on to the expensive house! When the Ambani residence is finished in January, completing a four-year process, it will be 550 feet high with 400,000 square feet of interior space. 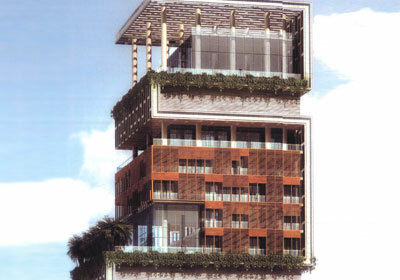 The Ambani home, called Antilla, differs in that no two floors are alike in either plans or materials used. At the request of Nita Ambani, say the designers, if a metal, wood or crystal is part of the ninth-floor design, it shouldn’t be used on the eleventh floor, for example. The idea is to blend styles and architectural elements so spaces give the feel of consistency, but without repetition. Atop six stories of parking lots, Antilla’s living quarters begin at a lobby with nine elevators, as well as several storage rooms and lounges. Down dual stairways with silver-covered railings is a large ballroom with 80% of its ceiling covered in crystal chandeliers. It features a retractable showcase for pieces of art, a mount of LCD monitors and embedded speakers, as well as stages for entertainment. The hall opens to an indoor/outdoor bar, green rooms, powder rooms and allows access to a nearby “entourage room” for security guards and assistants to relax. Ambani plans to occasionally use the residence for corporate entertainment, and the family wants the look and feel of the home’s interior to be distinctly Indian; 85% of the materials and labor will come from outside the U.S., most of it from India. Ha, occasionally. Check out some more pictures here.